Sri Lanka scored nominal 275 runs in their first innings and got a solid response from England who thrashed 460 and gained a first innings lead of 185 runs. The home team was in crisis in their second innings and scored 218 runs for the loss of 6 wickets at stumps on the fourth day. The second and final Test has entered an interesting stage which is being played at P Sara Oval, Colombo and will come to an end on April 7, 2012. Earlier, the Islanders started their second innings on the day with four runs on board in one over and their openers Dhammika Prasad and Lahiru Thirimanne were yet to open their accounts. They initiated the day with caution and added 19 runs in the overnight total when the later was caught by Andrew Strauss in the slips off James Anderson for 11. The experienced Tillakaratne Dilshan came in next as Prasad was dropped on 21 runs by Steven Finn at mid-off on the bowling of Graeme Swann. 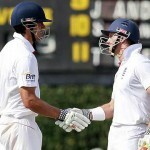 The duo took the score to 64 when Prasad was caught at deep square leg by Tim Bresnan off Steven Finn for 34 runs. Kumar Sangakkara joined in with Dilshan and tried to stabilise the innings but the runs were hard to come due to controlled bowling by the England bowlers. The first hundred of the innings was scored in the 34th over and Dilshan was gone for 35 on the first ball of the 36th over even after he asked for the review. The third wicket was lost at 104 runs and 21 runs later Sangakkara went back to pavilion for 21 runs when he was caught behind by Matt Prior off Graeme Swann. The skipper Mahela Jayawardene and Thilan Samaraweera put their heads down to take their team out of the critical situation. England bowlers bowled to their line and length as the batsmen could manage just 14 runs from over no.47 to 56 when tea was taken at 139 for the loss of four wickets. The repair work was carried on after tea interval by the two batsmen and they posted just three boundaries until the end of the 75th over. Samaraweera dispatched back to back fours in the 77th over and the proceedings were going towards recovery. The fifth wicket partnership produced 90 valuable runs when Thilan Samaraweera was clean bowled by Swann for 47 runs. The fifth wicket was lost on the first ball of the 90th over on 215 runs and one ball later Suraj Randiv was bowled for a duck. Sri Lanka was struggling at 218 with just four wickets in hand and their only hope lies with Mahela Jayawardene who is still fighting with unbeaten 55 runs. Graeme Swann was the pick of the bowlers with four wickets as James Anderson and Steven Finn shared one wicket each. England has a clear edge at the close of the fourth day’s play and they are very near to clinch their first win of the winter.